Le Club AccorHotels has launched a new promotion for stays at new and refurbished hotels in Spain and Portugal. Members can earn 500 bonus points each for their first four stays between October 12 – December 31, 2016, that are booked October 12 – November 12. Note that it is unclear what these new and refurbished hotels are. Le Club AccorHotels has not listed them on this web page. Nice bonus for those that plan to stay in these two countries by the end of the year and an easy way to collect those valuable points that count towards status only if Accor would have actually listed the eligible properties. 1. 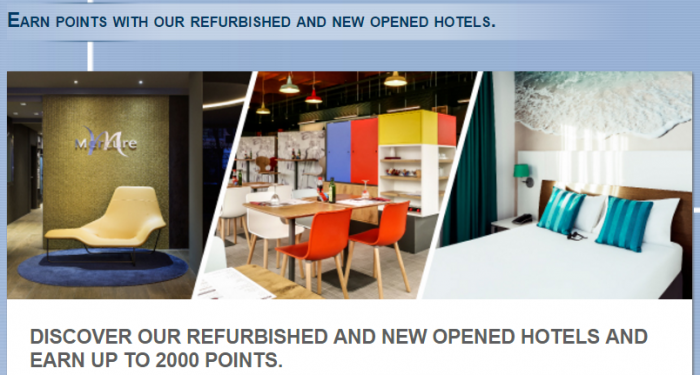 General Le Club AccorHotels terms and conditions apply to the Welcome back offer and you must be Le Club AccorHotels member to benefit from it. 2. This offer entitles Le Club AccorHotels members, regardless of their status, to benefit from earning 500 points for a stay in one of the participating hotels of this offer and in the Le Club AccorHotels Loyalty program with a maximum of 4 different stays. Only members who received the emailing communication will be able to earn this points. 3. This offer is valid for a member’s stay from 12/10/2016 to 31/12/2016 in one of the participating hotels in Spain and Portugal, and booked between 12/10/2016 and 12/11/2016. 5. Any consecutive stays (check-out and check-in same day) in the same hotel, will be considered as a single stay. This single stay will be eligible once to the Welcome back offer. 13. Please specify the reference 47841 in all your communications with AccorHotels call centers or customers care services related to this offer. Previous articleEurowings Cabin Crew Strike Coming As Early As Coming Monday 24th October 2016 – Check Your Flight Status!